Seating can be a treasure trove of unique design features created for your lifestyle. Hidden under seat storage or corner benches can make the most of a small space whilst benches and chairs can bring those finishing touches to a room. From fitted day beds and banquettes to unique chairs and benches, Lozi can create a variety of bespoke seating to fit your needs. Jessica came to Lozi with a wonderful challenge - fitting a kitchen island, day bed, dining corner, shelving and hidden storage into her small kitchen in East London. Lozi created a smooth curved sofa area, making the most of the space with under-seat drawers. A small table creates a dedicated dining area without encumbering the space. The colour scheme ties together thanks to a gently contrasting oak veneer and emerald green upholstery, with smoke green paint adding the final touches. Emma and David needed a corner seat for their kitchen in North London. Rich oak veneer gives this seat a luxurious finish and, combined with an edge grain surface Sea table, creates a neat and practical dining area. Extra storage is created with underset cubby holes. This bold and bright kitchen banquette was created for a colour filled house on Valetta Road in West London. A long smoke green and deep plum banquette slots into the corner of this kitchen, creating ample room for entertaining thanks to an extra long Sea Table as well as hiding a myriad of secret storage boxes underneath. This banquette was part of a beautiful full kitchen renovation by Lozi. Cass’s graphic solid oak and plywood bench offsets her majestic yet homely kitchen table. A bespoke Wave Bench, with recycled yogurt pot surface, matches Anna & Kirsty’s Sea table in their Brighton kitchen. Benches are a modern and practical seating choice for a kitchen table. With more flexibility than individual chairs, they can bring a relaxed and familial air to a room as well as fitting neatly under the table when not in use. 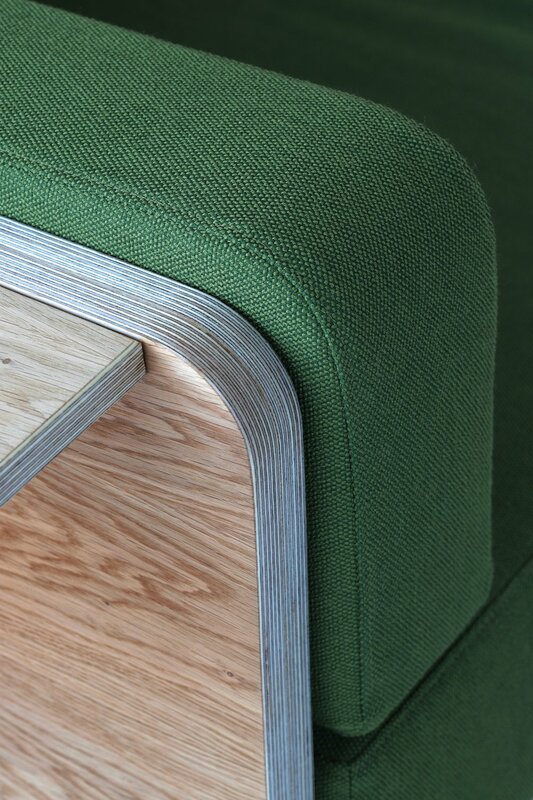 Lozi can create a fully bespoke design or customise our Wave Bench with various finishes.